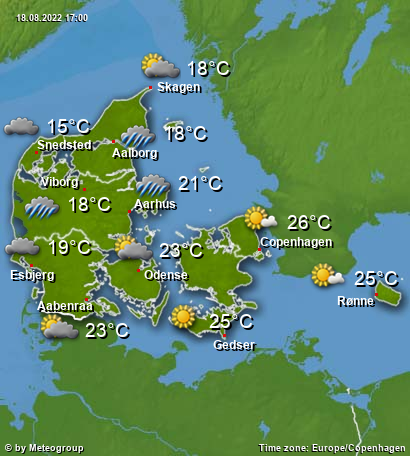 Odense - On Thursday we can expect sunny weather. On Vejrcentral you will find current weather data, local weather forecasts and a treasure of useful information around weather. Thanks to our high-resolution weather radar and current severe weather warnings there will be no nasty surprise any more. Like many other countries in Central and Northern Europe, the Kingdom of Denmark is part of the temperate climate zone. This means that the climatic conditions are relatively balanced throughout the year. The Gulf Stream (also called the North Atlantic Current) plays a crucial role in this. It brings warmth to Denmark from the Atlantic and has a temperature regulating effect, resulting in a mild maritime climate. The sea water acts as a heater, especially in winter, so that in the western half of the country the temperature rarely falls below freezing point. However, the North Atlantic Current reaches the Baltic Sea in a rather weakened form, so the winter is a little cooler here. In the summer, the mean daily maximum values are a comfortable 20 to 25 °C, mostly due to the country being close to the water. Overall, the annual average temperature is 8.5 °C, with 7.5 °C in the north. Despite its maritime location, Denmark has relatively little rainfall compared to other coastal states at similar latitudes. The average annual precipitation is 500 to 600 litres per square metre in the east and 700 to 800 litres per square metre in the west. Most of the 150 rainy days in a year fall in the winter months. Low pressure systems often move in from the Atlantic, especially in autumn and spring. These are often accompanied by stormy winds, so it is always worth taking a look at the latest weather warnings.